The accretion of grains to larger bodies is one of the maim problems in the theory of formation of planets and satellites. In parts A and B we have found that this process takes place in two steps, the first one leading to the formation of jet streams and the second one, studied in chs. 6 and 12, leading to the formation of large bodies inside the jet streams. The first three chapters (15-17) of part C represent am attempt to trace the plasma processes that have led to the formation of grains. In ch. 17 we found that under certain conditions a state called partial corotation may be established, which places grains in Kepler orbits with eccentricity of 1/3. Whether the conditions for partial corotation were really satisfied during hetegonic times can be ascertained only by looking for evidence in the solar system today that may have derived from such a state. This chapter shall be devoted to such evidence. More specifically, we shall study the intermediate process (namely, the accretion of grains and the formation of jet streams) and compare the products of these processes with observations. The study is facilitated by the fact that in certain parts of the solar system we find intermediate products of these processes. In the asteroidal region as well as in the Saturnian ring system accretion has not led to the formation of large bodies, a process which necessarily obliterates much of the stored information. In the asteroidal region the reason for this seems to be the extremely low space density of the condensed matter (see sec. 4.3.4), whereas in the Saturnian ring system the formation of large bodies has been prevented because the region is situated inside the Roche limit. (3) A theory of the formation of jet streams as am intermediate stage in the formation of satellites and planets. We have tried to develop the first of the above theories in secs. 18.5-18.6, the second in secs. 18.7-18.8, and the third in sec. 18.10. The accretion of grains to larger bodies has been treated in part B where observations were predominately analyzed with the aid of celestial mechanics. Here we shall treat the same problem, but as a starting point we choose the state of partial corotation and the motion of grains resulting from it. As we shall discover, it is possible to unify the two pictures. In a partially corotating plasma, grains are placed in Kepler ellipses with e = 1/3 (fig. 17.5.1). The major axis of such an ellipse passes through the point of condensation (the apocenter) and the central body (focus), and the minor axis is located in the equatorial plane. The pericentric distance is 1/2, and the distance of the nodes is 2/3 of the apocentric distance. We shall study the development of an assembly of such grains under the action of gravitational forces alone. Pursuing the ideas of ch. 5, we assume that the interaction of the grains with the plasma is negligible, and that electromagnetic forces do not influence their motion. The meaning of these assumptions has already been analyzed quantitatively in ch. 5. Under the idealized assumptions of a spherical homogeneous central body with a single grain orbiting around it, the orbit of this grain will remain unchanged with time. If the central body assumes an ellipsoidal shape due to rotation, this will result in a secular change (precession) in the orientation of the orbit of the grain (see ch. 3). In a realistic case, one must also consider the gravitational perturbations from other neighboring celestial bodies, whether full grown or embryonic. Such perturbations also produce precession. (At the same time they produce long period changes in the eccentricity and inclination of the orbit, but these are of small amplitude and not very important in this connection.) If other grains are present in the same region of space, the gravitation from their dispersed mass also produces secular disturbances of the same type. However, the most important systematic change in the orbits of an assembly of grains is due to their mutual collisions, which are inelastic, or at least partially so. At such a collision, kinetic energy is converted into heat but the sum of the orbital angular momenta of the two colliding grains does not change. Collisions may also result in fragmentation or in accretion. The general result of inelastic collisions within a population of grains with intersecting orbits is that the eccentricities of the orbits decrease with time, and so do the inclinations in relation to the invariant plane of the population (fig. 18.2.1). 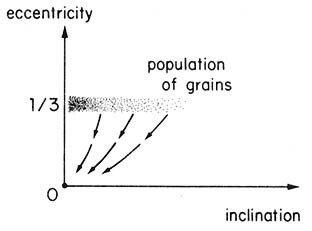 In our model of condensation of grains, the angular momentum of the population of grains ultimately derives from the rotation of the central body. Assuming the process of condensation to be symmetrical with respect to the equatorial plane, the invariant plane of the population will be coincident with the equatorial plane. FIGURE 18.2.1.- Development of a population of grams originally orbiting m ellipses with eccentricity e = 1/3 and varying inclinations i. The final state with e = 0 and i = 0 is either a thin disc of grains or a group of planets. (or satellites), in circular orbits in an equatorial plane. ....grains may be important, particularly in the case of small grains. If we consider the gas molecules as extremely small "grains," the presence of gas essentially means an enrichment of population in the low end of the mass spectrum of the grains. However, we must observe that collisions between molecules may be perfectly elastic, whereas collisions involving grains and aggregates are always more or less inelastic. Using the terminology of secs. 3.2-3.4, we can state that collisions and viscosity make both the axial oscillations and the epicycle motion decrease, eventually leaving the grains in unperturbed circular orbits. One example of this state is the Saturnian ring system, where a large number of small bodies form an extremely thin disc (thickness ~2 km or less), each body moving in a circle with an angular velocity that decreases outward according to Kepler's laws. A general survey of the state of the Saturnian rings may be found in Cook et al. (1973). Other examples of relatively unperturbed circular motion are the different groups of planets or satellites (see sec. 18.10). Each one of the bodies in a group is likely to have formed from a single population of grains that evolved through mutual collisions. Most of the planets and satellites move in almost circular orbits with small inclinations. The asteroids represent an intermediate stage in this evolution. The present eccentricities are on the average about one-half of the original value 0.33, and the present inclinations probably represent a similar decrease in relation to the unknown primeval distribution. (1) The density of the grains is = 0.70(2.44/2.88)3 = 0.75 g/cm3. (2) The grains behave like drops of a perfect fluid. (3) The gravitational field of all adjacent grains can be neglected. We have no independent way of determining the density of the grains, so (1) may or may not be true. According to some authors, the material in the rings is likely to occur as loosely bound particles in the form of spindle-shaped aggregates with their long axes tangent to their orbits; that is, at right angles to what is supposed in the Roche theory. Other authors have proposed similar elongated aggregates but with their long axes perpendicular to the equatorial plane. So (2) is probably not satisfied. The mass of the ring is so small that it does not perturb the Saturnian gravitational field very much. The tidal effect, however, is produced by the field gradient, and adjacent grains may very well produce local perturbations. Hence it is doubtful whether (3) is satisfied. The conclusion is that the identification of the outer border of the ring with the Roche limit is not very convincing from a theoretical point of view. However, from an observational point of view there is no doubt that the outer limit of the ring marks the border between one region where matter does not accrete to larger bodies and another region where it does accrete to satellites. We shall call this limit the "modified Roche limit" (rMR). It is reasonable that this limit is determined by the tidal disruption, but the theory for this is much more complicated and possibly rather different from the classical Roche theory. Inside rMR matter will be much more dispersed than outside so that the mean free path between collisions will be much smaller in this region than outside of rMR. Consider a state when the condensation or plasma capture of grains has proceeded for some time and a large number of grains has been produced. Inside rMR collisions between the grains have damped their radial and axial oscillations so that they move in circular orbits and form a thin disc in the equatorial plane. Newly condensed grains moving in orbits with nonzero inclination will pass this plane twice in every orbital revolution. Sooner or later such a new grain will collide with a disc grain knocking the latter out of the disc. The two grains will continue to oscillate about the plane of the  disc, but will collide again with other disc grains. After some time the oscillations are damped out and all grains will be incorporated in the disc. In the model we are going to develop we assume that inside rMR disturbances caused by the arrival of a newly formed grain are so small and so rapidly damped out that every new grain essentially interacts with a thin disc of grains that condensed earlier. Outside rMR the collisions between the grains lead to accretion, first to larger aggregates or embryos and eventually to satellites. If this process is rapid enough, the mean free path between collisions may continue to be so long that the grains do not settle into the equatorial plane before new grains arrive. Hence collisions may also take place outside the equatorial plane. This may lead to a formation of jet streams. Although the theory of formation of jet streams is not yet worked out well enough to specify in detail the conditions for this, the general discussion in ch. 6 indicates that when condensation takes place outside the limit rMR a series of jet streams will probably form. At the same time collisions will often result in production of extremely small grains by fragmentation or recondensation of vapor. As these small grains mutually collide they may form a thin disc (possibly with a small total mass) even outside the rMR limit, and coexisting with the jet streams. Hence our model of orbit development should deal with two regions: one for r < rMR, in which the accretion leads to the formation of a thin disc, and the other for r > rMR, where it leads to the formation of jet streams. As found in sec. 17.5, a grain generated at in a coordinate system with the equatorial plane as the reference plane and the origin at the center of the central body will intersect the equatorial disc at . We center our attention on a condensation so close to the equatorial plane that we can put cos 1 (but we exclude a very thin region close to the plane because of the singularity for = 0 (see sec. 17.2). In this case the angular momentum of a new grain with reference to the axis of the coordinate system is the same as that of the disc grains at r = 2r0/3. Hence the tangential component of its velocity at collision with a disc grain equals the tangential velocity of the disc grain so that, seen from the disc grain, the velocity of the new grain lies in the meridional plane. Its component parallel to the axis is and the component in the equatorial plane is (GMc/12r0)1/2. Let us first discuss the case in which the collision between the new grain and the disc grain is almost perfectly inelastic, by which we mean that the relative velocity between two grains after collision is small but not zero. Such a collision does not change the angular momentum of either grain, but only their velocity components in the meridional plane. After the collision, the grains will return to the equatorial plane at the point , where they may collide again with other disc grains. In this way new disc grains will be set in motion, but they will all reach the equatorial plane again at . A repetition of this process will result in more and more disc grains being set in motion with decreasing amplitude, so that the perturbation caused by the new grain is damped out and the grain is incorporated into the disc. It is important to observe that this whole process affects only the disc grains at r = 2r0/3. The rest of the disc remains entirely unaffected (see fig. 17.5.1). This means that the disc can be regarded as a kinematic image of the condensing plasma diminished in the proportion 2/3. We shall now discuss the limitations of our idealized model. (1) If the collision between the grains is only partially inelastic, part of the momentum contained in velocity components in the meridional plane may cause a change in the angular momentum. This will also cause a "diffusion" of the perturbation to grains closer or more distant than 2r0/3. In a realistic case this diffusion may not be very important. (2) If cos < 1, disc grains at 2r0/3 will be hit by new grains with smaller angular momenta. This will cause the grains to slowly spiral inward as they orbit around the central body. However, if the grains reach a region where they are not hit by new grains, the inward motion stops. (3) The idealized case is applicable if the disc is opaque so that the new grain collides with a disc grain at its first passage. If the disc is not opaque, so that the grain is not likely to collide until after many transits, we must introduce the restriction that the collision should take place before a considerable change in the orbit of the new grain has taken place. Such a change may be due to precession, but it may also be produced by collisions outside the equatorial plane. (4) The collision may also result in accretion or in fragmentation. In the latter case, all the fragments will move in orbits which bring them back at the point of fragmentation where they may collide again. Thus the fragments will in course of time be incorporated in the disc by the mechanism discussed above. The same is true of accretion. The entire process may be visualized as damping of oscillations around a circular orbit at r = 2r0/3 (sec. 3.3). FIGURE 18.6.1.- Photometric curve of the Saturnian rings (according to Dollfus, 1961). The abscissa gives the distance from the center of Saturn in cm. The top scale giver. the orbital period of the particles.. The periods., which are integral fractions. of the periods. Of the inner Saturnian satellites, are marked in the upper part of the diagram. According to the resonance theory, the density minima in the ring system should be produced by resonance with there satellites. The lack of correlation between low-integer resonances and structural features shows. that this is. not the care. ....the A ring and is separated by a dark region called Cassini's division from the B ring which is the brightest of the rings. Inside the B ring is the very faint C ring, also known as the crape ring on account of its darkness. The photometric curve given by Dollfus (fig. 18.6.1) shows that near the outer edge of the A ring there is a series of light maxima and minima. A double minimum exists near the inner edge of the B ring. In the middle of the B ring two minima are visible. The rings lie in the equatorial plane of the planet and consist of numerous small particles that orbit around the planet with the orbital period increasing outward in accordance with Kepler's law The thickness of the rings is about 2 km (Cook et al., 1973). The suggestion has been made in the past that the structure of the ring system is produced by resonance effects with the inner satellites. Different investigators have claimed that Cassini's division is due to a resonance with Mimas resulting in removal of particles from the dark region; the particles  are removed because their period is exactly 1/2 of the period of Mimas. The resonance corresponding to 1/3 of the period of Enceladus also falls close to Cassini's division. In a similar way the sharp change in intensity between the B ring and the C ring should be connected with the 1/3 resonance with the period of Mimas. A list of claimed resonances has been given by Alexander (1953, 1962). Figure 18.6.1 shows a plot of all resonances with denominators 10. The resonances with denominators 5 are marked with heavy lines. A number of resonance points of Mimas and Tethys are similar because the period of Mimas is half the period of Tethys. The same is the case for the pair Enceladus-Dione. It should be remembered that the periods of Mimas, Enceladus, Tethys, and Dione are approximately proportional to 2/3/4/6; see table 8.5.1. As was pointed out in sec. 8.7, a comparison between the calculated resonance points and the observed pattern of the ring system does not show any obvious connection. The 1/2 resonance of Mimas definitely falls inside Cassini's division. Half the period of Mimas differs by 1.2 percent from the period of the outermost particles of the B ring and by 4 percent from that of the innermost particles of the A ring. The difference between the 1/3 resonance with Enceladus and Cassini's division is still larger. Nor is there any obvious connection between other markings, bright or dark, and the resonance points. In this respect the Saturnian rings are strikingly different from the asteroid belt, where there are very pronounced gaps corresponding to integral fractions of Jupiter's period (the Kirkwood gaps). For example, near the resonances 1/3 and 2/5 of Jupiter's period there is a complete absence of observed asteroids (see figs. 4.3.3 and 18.6.2). As Cassini's division has been attributed to resonances that are displaced by a few percent, it is of interest to see whether a similar asymmetry exists for the asteroids. We see from figs. 4.3.3 and 18.6.2, with reference to the resonance points the asymmetry of the gaps, if any, is only a fraction of 1 percent. The half-width is about 1.5 percent. Hence with the same relative breadth any resonance gaps corresponding to 1/2 Mimas' and 1/3 Enceladus' periods would be altogether within the B ring and outside Cassini's division. Further, there is not the slightest trace of a resonance gap in the B ring corresponding to either 2/5 of Mimas' period or 1/3 of Enceladus' period. Therefore, from an observational point of view there is no real similarity between the asteroid gaps on one side and the low-density regions of the Saturnian rings on the other. In fact, fig. 18.6.1 indicates that if anything is characteristic for Cassini's division it is that not a single resonance point falls in that region. FIGURE 18.6.2.- The number of asteroids as a function of the semimajor axis showing gaps in the asteroid belt. The vertical arrows mark the orbital distances where the period of an asteroid is 1/3 or 2/5 of the period of Jupiter. The horizontal arrows extend I percent of the orbital distance for each resonance indicating the close correspondence of resonance points to these Kirkwood gaps. The reason why there are resonance gaps in the asteroid belt but not in t he Saturnian rings is that the mass ratio Jupiter/Sum lo 10 000 times larger than the mass ratio Mimas/Saturn. ....of the perturbing force. The masses of Mimas and Enceladus are of the order of 10-7 of the Saturnian mass, whereas the mass of Jupiter is about 10-3 of the solar mass. As by definition the ratio of the relative distances from the perturbed bodies to the central body and to the perturbing body is the same in the two cases, the relative magnitude of the perturbing force is about 10-4 times less in the Saturnian rings than in the asteroidal belt. Hence it seems legitimate to doubt whether Mimas and Enceladus are large enough to produce any phenomenon similar to the asteroid gaps. In fact the sharpness of a resonance effect is generally inversely proportional to the perturbing force. Hence we should expect the relative breadth of a Kirkwood gap in the Saturnian rings to be 10-4. of the breadth in the asteroid population. As the latter is of the order of I percent, the dark marking in the Saturnian rings should have a relative breadth of 10-4 percent, which is well below the limit of observability. These objections to the resonance theory also apply to its recent development by Franklin and Colombo (1970). Further, it should be noted that the resonance theories have so far not been able to give an acceptable explanation of why the B ring is brighter than the A ring. Concerning the sharp limit between the B ring and the C ring it has been claimed that the 1/3 resonance of Mimas should be responsible for the very large positive derivative of the light curve. However, the 1/3 resonance of Enceladus is situated somewhat inside Cassini's division in a region where the derivative of the light curve is slightly negative. There is no obvious reason why the same type of resonance with different satellites should  produce such different results. 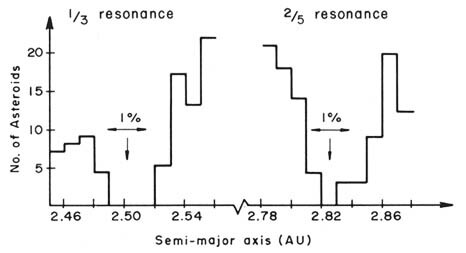 Furthermore, in the asteroid belt the 1/3 resonance with Jupiter produces a sharp gap, but the mass densities on both sides of the gap are about equal (fig. 4.3.4). 18.6.2. Can the Structure of the Saturnian Rings Be of Hetegonic Origin? Our conclusion is that the resonance theory has not succeeded in explaining the main characteristics of the Saturnian rings. Furthermore, it is difficult to imagine that any other force acting at the present time could produce the observed structure. We therefore ask ourselves whether the structure of the rings could have been produced when the rings were formed and preserved for 4 or 5 billion years to the present time. Such a view implies, however, that at least some parts of the solar system have an enormous degree of dynamic stability. Many scientists may object to this idea. Nevertheless, we have already found that except in the cases when tidal braking has been important (Earth, Neptune, and perhaps Mercury) planetary spins have probably not changed very much since hetegonic times (see secs. 9.7 and 9.8). Furthermore, as found in sec. 8.1, the orbit-orbit resonances must also have been produced at the time the bodies were formed. The general conclusions in ch. 10 indicate that with a few exceptions there has been very little dynamic change in the solar system since its formation. Hence there should be no a priori objections to the view that the present structure of the Saturnian rings was produced when the rings were formed and that even the fine structure may have originated during formation. Several independent arguments, experimental as well as theoretical, suggest that the hetegonic era of the solar system must have extended over a time period of the order 3 X 108 yr (see secs. 12 8-12.9) In the Saturnian region, the matter which at present constitutes the satellites and the rings would consequently have been introduced around the planet during an extended period of time. This emplacement can be envisaged as a continuous infall of gas, or an injection of a series of gas jets, during a period perhaps as long as 3 X 108 yr The gas became ionized upon reaching critical velocity (ch. 21), was brought into a state of partial corotation (ch. 17), and the condensable components of the resulting plasma condensed to grains. It is also possible that a significant fraction of the condensable material consisted of transplanetary dust, which at infall became electromagnetically trapped by the plasma emplaced around the planet. However, these processes are relatively very rapid; at any given moment only a very small fraction of the  total mass now forming the secondary bodies in the solar system could have been present as plasma or neutral gas. Hence the process was producing grains more or less continuously during a very long time. In sec. 18.5 we discussed some basic processes in the formation of the rings under the assumption that they formed from a partially corotating plasma. The result was that the grains which at present are orbiting at a central distance r originally condensed out of a plasma at a distance 3r/2. The disc forms a "kinematic image" of the plasma diminished by a factor of 2/3. Therefore, if we want to find the place of origin of present grains, we should enlarge the present orbits by a factor 3/2. The result is shown in fig. 18.6.3. We find that Cassini's division is projected into the region where Mimas moves, and the border between the B ring and the C ring coincides with the outer edge of the A ring. Remembering that the grains, condensed at a certain distance, interact only with disc grains at 2/3 of this distance, we may interpret the figure in the following way. FIGURE 18.6.3.- Condensation of grains from a partially corotating plasma in the environment of Saturn. The condensation is assumed to take place essentially from the neighborhood of the equatorial plane (but only a negligible part in the plane itself). The figure refers to a state in which part of the plasma has already condensed so that Mimas (or its parent jet stream) and the rings already exist, although with only a small part of their present masses The upper part of the figure refers to the plasma which has not yet condensed. The plasma near the orbit of Mimas condenses on this satellite (or on the jet stream in which it accretes), leaving the "region swept by Mimas" void of plasma. Similarly, the plasma in the region of the extant A ring (and B ring) condenses directly on the grains of the ring. When the grains produced by condensation fall down to 2/3 of their original central distances, the state depicted in the lower part of the figure is produced. Cassini's division is derived from the region swept by Mimas The C ring has a reduced intensity because part of the plasma has condensed on the already existing grains of the A ring. In the region where Mimas moves, a large part of the revolving plasma will condense on Mimas (or perhaps rather on the component grains of the jet stream within which Mimas is forming). Hence in this region there will be little plasma left to form the grains which later would be found at 2/3 of the central distance to Mimas. In other words, we may interpret Cassini's division as what we may call the hetegonic shadow of Mimas. The plasma outside the orbit of Mimas condenses to grains which, having fallen to 2/3 of their initial distance, form the present A ring. However, before they reach this position they have to pass through Mimas' jet stream and part of them will be captured by it. The grains condensing from plasma inside Mimas' orbit fall down to 2/3 of their initial position without passing through Mimas' orbit and form the B ring. This may explain why the B ring is brighter than the A ring. If the radial distance of the limit between the B and C rings is magnified by a factor 2/3, it coincides with the radial distance of the outer edge of the A ring. The reason for this is that plasma falling into the region inside rMR will rapidly be gathered by the grains already existing there as the growing A ring, thus depleting the plasma which gives rise to C ring grains. In the same way as Mimas produces Cassini's division as its hetegonic shadow at 2/3 of its central distance, the outer edge of the A ring is imaged at 2/3 of its distance. The qualitative picture in fig. 18.6.3 can be refined and compared directly with observation: See fig. 18.6.4. In the upper left corner the ordinate of the light curve has been reversed and the abscissa reduced by a factor of 2/3. The depletion of plasma causing the hetegonic shadow should depend on the total surface area of the matter, which is proportional to the luminosity. The figure shows that the drop in intensity from the B ring to the C ring occurs almost exactly where we expect the hetegonic shadow to appear. In fact Dollfus' value for the outer limit of the A ring is 13.74 X 109 cm and for the border between the B ring and C ring 9.16 X 109 cm. The ratio between these values happens to be exactly 1.50 = 3/2. FIGURE 13.6.4.- Hetegonic effects in the Saturnian ring system. Dollfus' photometric profile compared with Mimas' orbital distance reduced by a factor 2/8 (or 0.65). Cassini's division may be the "hetegonic shadow" of Mimas. In the left comer, the photometric profile is turned upside down. and reduced by the factor 2/3 ("ring's own. shadow"). The rapid drop in intensity between the B ring and C ring coincides with the beginning of this shadow. ....deviation from the value 3/2 of the simple theory can be explained in two ways. It may be an indirect effect of the production of a shadow (Alfvén, 1954) or it may be due to condensation at such a large distance from the equatorial plane that cos <1. In contrast, in the resonance theory of Cassini's division it is difficult to see why there should be any deviation from the theoretical resonance, which, as mentioned, is clearly outside Cassini's division. A model of accretion outside the modified Roche limit must necessarily include a number of hypotheses because we do not know under what conditions a collision results in fragmentation or in accretion, or to what degree it is inelastic. Also, the theory of jet streams is not very well developed, and, in fact, cannot be, until the collision response is quantitatively clarified. These uncertainties were not very serious for a theory of accretion inside rMR, mainly because the condensed grains almost immediately reached their final location. It is more serious outside rMR because the eventual formation of planets and satellites involves a long chain of processes. Our approach must necessarily be partly phenomenological and essentially provisional. According to the model in sec. 18.4, outside rMR most of the condensed grains will be captured into jet streams. This does not exclude the existence of a thin disc in the equatorial plane consisting of very small grains resulting from fragmentation and impact vapor condensation; such a disc would not substantially affect the formation of jet streams. Important aspects of the formation of planets and satellites may be clarified by studying the present state of the asteroidal belt. As has been pointed out in sec. 11.8, this state may be considered as an intermediate "planetesimal" state in planet formation, or in any case as being related to this state. The reason why matter has not gathered into one single body in this region is likely to be the extremely low distributed density of matter condensed there. Indeed, the distributed density is about 10-5 of the density in the regions of the giant planets and the terrestrial planets (sec. 2.5). This may mean that accretion takes 105 times longer for completion in the asteroidal belt. Hence, even if the time for complete accretion of the terrestrial planets were as short as 107 yr, planet formation in the asteroidal belt would require a time longer than the present age of the solar system. There is also the possibility that, due to the low density, accretion never will proceed to the single planet state in the asteroid belt. Hence the study of the asteroidal region is very important because it will clarify essential features of planetesimal evolution. However, we need not necessarily assume that it is in all details an analog of an early state in, for example, the terrestrial region before the formation of the Earth. Not only the space density but also the structure and composition of the grains and the progression of the collisional processes may be different. In this section we shall study whether the essential features of the asteroid belt cam be interpreted as a result of condensation from a partially corotating plasma. (1) The asteroidal belt is very far outside rMR. No tidal disruption prevents the buildup of larger bodies. (2) The space density is very low so that collisions are rare. The time scale for development is very large. (3) Whereas the reason why the grains forming the Saturnian rings have not accreted to larger bodies is that they are moving inside the Roche limit, in the asteroid belt, the bodies have not yet accreted to planets because the density is very low. ...of which there are no analogs in the Saturnian rings for reasons discussed in sec. 18.6.1. The outer border of the main groups of asteroids is situated at a solar distance of 2/3 the distance of Jupiter (figs. 4.3.3 and 18.8.1). On condensing, the grains move in ellipses with e= 1/3; hence those grains which form outside the orbit of Jupiter repeatedly cross Jupiter's orbit and there is a high probability that either they are captured by Jupiter (or the jet stream in which Jupiter is forming) or their orbits are perturbed so that they will not ultimately be found at 2/3 of their place of origin. For this reason there are very few asteroids outside 2/3 of Jupiter's orbit, This means that there is no real correspondence to the A ring of the Saturnian system. Mimas, with a mass of only 10-7 of the Saturnian mass, has reduced the intensity of the A ring (compared to the B ring), but only to a limited extent. The inner limit to the asteroid belt is given by its "own hetegonic shadow," just as is the inner limit of the B ring around Saturn. The very few asteroids below a = 2.1 AU should be an analog to the very faint C ring. In ch. 4 both the (N, a) and the (M, a) diagrams of the asteroids (figs. 4.3.3-4.3.4) are shown. As the theory in the present chapter refers to the  mass distribution, it is preferable in connection with the present discussion to use the (M, a) diagram. This also has the advantage that, in contrast to the (N, a) diagram, this diagram is practically definitive; the discovery of new asteroids may change the (N, a) diagram, but, as the new asteroids necessarily are very small, the (M, a) diagram cannot be changed appreciably. Here we subject the (M, a) diagram to the same analysis as the Saturnian rings diagram (fig. 18.6.4) by turning it upside down and diminishing and translating it by a factor 2/3. Also Jupiter's shadow (translated to 2/3 of Jupiter's orbital distance) is plotted. We see that the (M, a) diagram gives a clear definition of the asteroid belt, giving very sharp inner and outer limits. Except the Hilda group which is due to a Jupiter resonance, there are no asteroids inside 2.1 AU or outside 3.50 AU in the diagram because their mass is very small. Looking at fig. 18.8.1, we see that the outer limit of the belt agrees within 1 percent with 2/3 of Jupiter's orbital distance. At almost exactly 2/3 of the outer limit there is a sharp drop in intensity (at 2.32 AU). The inner limit of the belt (at 2.16 AU) agrees just as satisfactorily with 2/3 of the limit (at 3.22 AU) where the density begins to be large (at the lower edge of the 1/2 resonance). It is more doubtful whether the Hildas show a shadow effect. We have found in sec. 17.5 that condensation from a partially corotating plasma should produce bodies at a final distance of 2/3 of the point of condensation. We have looked for observational confirmation of a fall-down ratio of 2/3 and have found several examples. In the Saturnian ring system the ratio 2/3 is found at two different places, and in the asteroidal belt in three places. We can regard this as a confirmation that partial corotation plays a decisive role in the condensation process. The theory of partial corotation implies a fall-down by a factor 2/3 only under the condition that the shape of the dipole field is not disturbed too much by currents in the plasma when it is being supported by the magnetic field and brought into corotation. In the case of the Saturnian magnetic field, we know that it must have been strong enough to support the plasma condensing to form Titan and Iapetus very far out. Because a dipole field decreases as r-3 we can be confident that in the region very close to Saturn where the ring was formed it  was strong enough to control the motion of the relatively thin plasma without being modified appreciably. Similar arguments hold for the asteroidal belt. As the average distributed density in the asteroidal belt is 10-5 of the density in the Jovian region, a solar magnetic field strong enough to support the plasma forming Jupiter is unlikely to be appreciably different from a dipole field in the asteroidal region. Hence in both cases where we have found evidence for a 2/3 fall-down ratio, we have good reasons to believe that the dipole field was unperturbed. Evolution of an asteroid-like assembly of bodies will lead to a general decrease in inclinations and eccentricities and eventually to am accretion of larger bodies. Since the space density in the present asteroidal region is very small, the time scale of development in this region is very long. In regions where the accumulation of primeval condensing plasma was much larger than in the asteroidal region, a more rapid development took place, leading to the formation of groups of densely populated jet streams of grains inside which satellites or planets formed. (1) The four Galilean satellites of Jupiter. (2) The five Uranian satellites. (3 ) The giant planets. (4) in the Saturnian satellite system, all the inner satellites out to Rhea have orbits with spacings roughly proportional to their distances from the planet, and their sizes increase in a fairly regular way with the distance. These satellites form an unbroken sequence of secondary bodies from the outer edge of the ring system out to Rhea This sequence may be considered as a group. (5) The distance between Rhea and the next outer satellite Titan is very large, and the disparity of masses between these two satellites is great. It is thus possible that Titan forms an outer group with the two other outer satellites Hyperion and lapetus, but this group is not at all as regular as the inner group. (6) Another irregular group consists of the Jovian satellites 6, 7 and 10. There are still a few more prograde satellites: One is the fifth satellite of Jupiter, Amalthea. Both its large distance to the Galilean satellites and its much smaller mass makes it impossible to count this as a member of the Galilean group. If we want to classify all the satellites, Amalthea must be considered as the only known member of a separate group. Further, the highly eccentric Neptunian satellite Nereid may be a remnant of an early group of regular satellites destroyed by the capture of Triton (McCord, 1966; Alfvén and Arrhenius, 1972a). Finally, the very small Martian satellites may be counted as a group of regular satellites. As grains initially move in orbits with e =1/3 after condensation, the ratio between their apocentric and pericentric distances is 2. Hence as long as the relative spacings between bodies are smaller than 2, we can be sure that the grains will be captured, sooner or later, by one of the bodies. Inside a group the relative spacings normally do not exceed 2 (for Uranus/Saturn, it is 2.01). This means that we may have had a production of grains m the entire region of space covered by the present groups of bodies, and all this mass should now be found in those bodies. However, the spacings between the groups, as we have defined them, is always greater than a factor 2. For Jupiter/Mars the ratio between their orbital radii is 3.42; for Titan/Rhea it is 2.32; for lo/Amalthea, 2.33; and for Jupiter 6/Callisto, 6.09. This means that there are regions in the gaps between groups where grains, if formed, cannot be captured by any body. From this we conclude that there must have been regions between the groups where no appreciable condensation took place. In other words, the different plasma clouds from which the groups have been formed were distinctly separated by regions where the density was very low. One such region is found between Jupiter and Mars. From the study of the asteroids we know that the density in this region was several orders of magnitude lower than the density within the regions of the giant planets and the terrestrial planets. Similar intermediate regions where the plasma must have had an extremely low density are found between Titan and Rhea, Io and Amalthea, and Jupiter 6 and Callisto. It is possible that in these regions a number of very small bodies, similar to the asteroids, may be found The same is possible in the region between the group of Uranian satellites and the planet itself, and also outside the orbit of Oberon. In theories of the Laplacian type it is postulated that the secondary bodies around a central body derive from a homogeneous disc. We have found that the distribution of mass in both the planetary system and the satellite systems is very far from such uniformity. Mass is accumulated at certain distances where groups of bodies are formed, but between the groups there are spacings which are practically devoid of matter. The formation of groups of bodies is shown schematically in fig. 18.10.1. FIGURE 18.10.1.- Diagram of the formation of a croup of bodies. Infalling gas is stopped and ionized at different distances from the central body The two regions in the figure may receive plasma simultaneously or during different epochs. Condensation of the plasma is rapid during the total infall period. Condensed grains are collected in jet streams which increase their mass during the whole infall period. Grains are stored in the jet streams as single particles and embryos (often for a lone period of time) until they are finally accreted by the largest embryo. In each region of plasma infall, 3-5 bodies are formed. According to Laplacian theories the explanation of the low-density region between Mars and Jupiter is that, because of the large mass of Jupiter, the condensation would have been disturbed inside its orbit. This is very unlikely. The solar distance of the asteroids (a = 2.1-3.5 AU) is about half the distance to Jupiter (a = 5.2 AU). As Jupiter's mass is 10-3 of the Sun's mass, the Jovian gravitation cannot be more than 0.1 percent of the solar gravitation in the asteroidal region. Certainly, as this is a perturbation of the Newtonian field, it produces a precession of the perihelion and the nodes of bodies orbiting in this region. Hence it may contribute to the disruption of the jet streams. However, the disruptive effect of Jupiter on jet streams active during the formation of Saturn would have been about equally large, and the same effect produced by Saturn during the accretion of Jupiter would also have been of the same order of magnitude. Hence a theory that attributes the absence of large bodies in the asteroidal region to the large size of Jupiter will run the risk of explaining away either Saturn or Jupiter. The mechanism of accretion we have considered is based on the behavior  of solid grains. In the first place it is a theory of those celestial bodies which consist mainly of nonvolatile elements. Such bodies are the terrestrial planets, including the Moon, and the asteroids. We know very little about the chemical composition of the satellites except that it is highly variable; existing data will be discussed in ch. 20. At least the smallest of them consists entirely of materials condensable at their solar distances since their masses are not large enough to keep an atmosphere. Some of the better known satellites of Jupiter have a mean density indicating that rocky material forms a substantial fraction of their mass; others must consist largely of icy or liquid components (Lewis, 1971b). The Saturnian satellite Titan, with a size almost twice that of our Moon, is capable of retaining a thin atmosphere. In the case of the giant planets, which perhaps mainly consist of volatile substances, the planetesimal accretion mechanism needs supplementation. This is a general complication with all planetesimal theories, and has attracted much attention already. Opik (1962) has tried to solve the problem through the assumption that the accretion of Jupiter (and the other giants) took place at such an extremely low temperature as to make even hydrogen solid. This means that Jupiter should have accreted from hydrogen snowflakes. The temperature which according to Opik is necessary for this process is about 4K, which seems to be unreasonably low. In our mechanism, in which the gas density is lower than that assumed by Opik, the required temperature would be even lower. Hence it is necessary to envisage direct accretion of gas from an interplanetary medium. To keep an atmosphere a body must possess a certain minimum mass. As Mars has an atmosphere but the Moon has none, we can conclude that under the conditions prevailing in the region of the inner planets the critical size should be of the order 1026 g. When through the accretion of solid grains an embryo has reached this mass, it is able to attract gas efficiently from the interplanetary medium and to retain it as an atmosphere, which eventually may contain more mass than the solid core. The giant planets may have accreted from a large number of planetesimals which were big enough to have an atmosphere. As none of the asteroids has reached the critical size, we have no hope of studying this process by observations in the asteroidal region. Hence the accretion of gas by a growing embryo is necessarily a more hypothetical process than those for which we can find analogies in present-day phenomena. The present very low density of gas in interplanetary space together with the action of the solar wind practically prevents planets from gravitationally accreting gas today. This process should be considered in relation to the jet-stream model discussed in chs. 6 and 12. The accretion of gas from an interplanetary medium may also occur in two steps. A jet stream could also have the property  of drawing in gas from its environment so that it has an "atmosphere." This means that the gas density inside a jet stream may be much larger than in the interstream medium. When an embryo inside a jet stream has reached the critical state (see sec. 11.4), it would then be accreting gas from a region with relatively high gas pressure. The presence of gas as a dissipative medium in some jet streams is suggested by the state of preservation of particles in carbonaceous chondrites. In these meteorites the characteristic products of collision melting and vaporization (chondrules) are a minor component or are entirely absent. Crystals magnetized before accretion have escaped collisional heating above the Curie temperature (Brecher, 1972a,b,c). The highly embrittled skin of isotropically irradiated crystals in gas-rich meteorites has been protected against destruction in the process of accretion of the parent body embryos (Wilkening et al., 1971). Hence it is necessary to assume that the lowering of relative velocities, required for accretion, was substantially aided by viscous energy losses other than inelastic collisions.